I had a hard time getting out of bed this morning - not because it’s so early, but because it was raining. I love lying in bed when it’s raining outside. 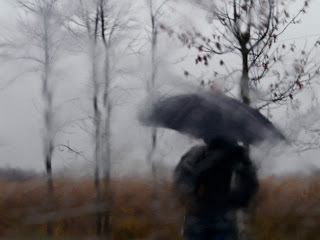 Not in a “I don’t want to go out” way, but in a listening to the soothing rhythm of the rain drops and remembering way. When I lived in Ireland, it rained almost everyday. I used to lie in bed far too late in the mornings, listening to the rain against the huge window over my bed. I was only there four months, and I only had one suitcase. Ireland didn’t always feel like home. But it did when it rained. I love rain. Those days rainy days you’re always saving for. Me too. I wanted to lie in bed this morning, not because it was early adn I wanted to sleep, but also just because I find this weather relaxing. So I came home and put my pjs back on before work, and am watching the rain while I chill on the computer and sip my tea, with no other sounds. And I’ve always loved that photograph. Agreed. Can’t speak for Ireland but I do love British rain.